Walter Eardley Harris was born on 6 Aug 1902 in Pateena, died on 19 May 1973 in Perth at age 70, and was buried in Perth General Cemetery. Walter married Melinda Jane Symons, daughter of George Symons and Martha Melinda Dennis, on 29 Apr 1925 in Invermay, Launceston. 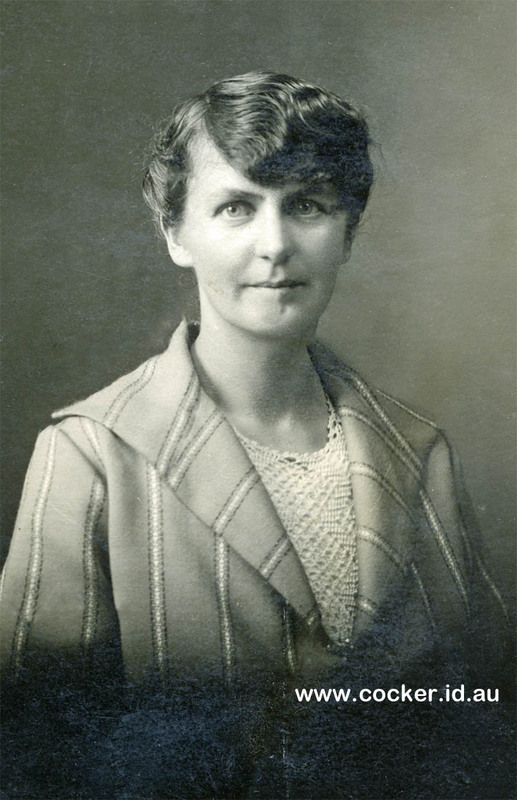 Melinda was born on 10 Jul 1890 in Beaconsfield, Tasmania, died on 9 Oct 1966 in Launceston, Tasmania at age 76, and was buried in the Perth General Cemetery. 4-Vera May Harris was born on 15 Oct 1921 and died in 1982 in Launceston, Tasmania at age 61. 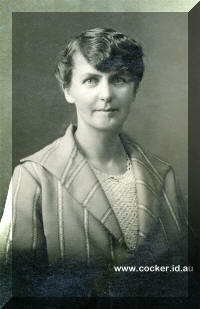 Vera married Maxwell Brooks. Maxwell died on 3 Feb 1992. 4-Reginald Walter Harris was born on 15 Mar 1929 in Launceston, Tasmania. 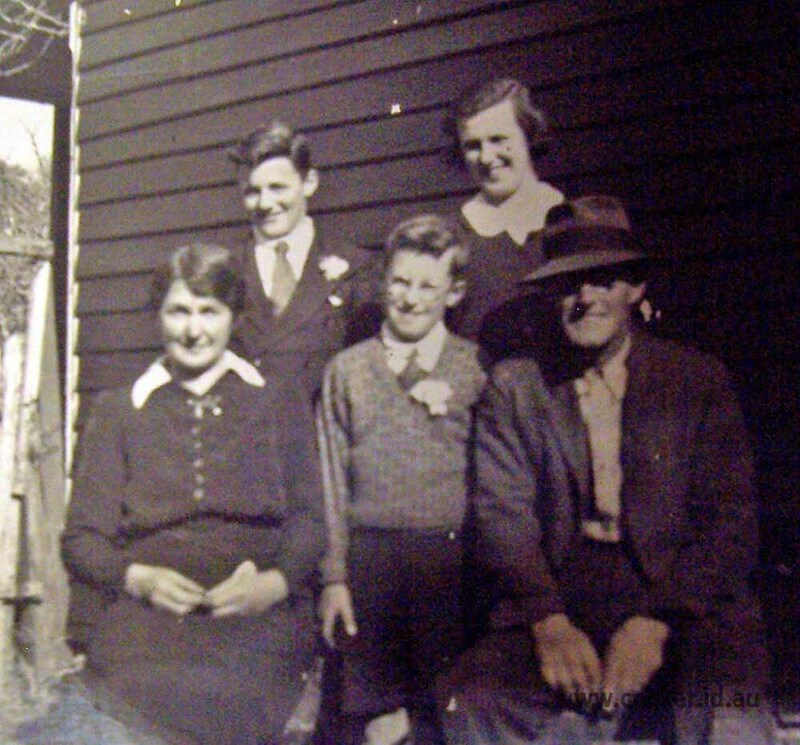 Reginald married Winifred Ila Douglas, daughter of Roderick Gordon Douglas and Ila Alice Findlay, on 6 May 1950 in Presbyterian Church, Newstead, Tasmania. Winifred was born on 28 Jan 1922 in Launceston, Tasmania, died on 1 Feb 1992 in Whittle Palliative Care Ward, Hobart, Tasmania at age 70, and was buried in Feb 1992 in Carr Villa Cemetery, Launceston, Tasmania. They had four children: Christopher Reginald, Philip Andrew, Rosalyn Margaret and Alan Gordon. 5-Christopher Reginald Harris was born on 5 Feb 1952 in Launceston, Tasmania. Christopher married Orysia Myroniuk on 24 Jan 1981 in Victoria. Orysia was born on 5 Jan 1950 in Rushworth, Victoria. They had two children: Svetlana and Cassandra. 6-Svetlana Harris was born on 27 Feb 1982 in Canberra, Australian Capital Territory. Svetlana married Tim Hall on 4 Jun 2011 in Brisbane, Queensland. They had one daughter: Rose. 7-Rose Hall was born in 2012 in Brisbane, Queensland. 6-Cassandra Harris was born on 28 Jan 1985 in Canberra, Australian Capital Territory. 5-Philip Andrew Harris was born on 12 Sep 1954 in Launceston, Tasmania. Philip married Aniela Cuebas on 26 Feb 1976 in Hobart, Tasmania. 5-Rosalyn Margaret Harris was born on 20 Dec 1958 in Launceston, Tasmania. Rosalyn married Andrew John Cocker, son of Dexter John Cocker and Mary Jennette Harvey, on 28 Jan 1984 in Hobart, Tasmania. Andrew was born on 14 Jun 1956 in Queen Victoria Maternity Hospital, Launceston. They had two children: Annabel Mary and Melanie Jane. 5-Alan Gordon Harris was born on 13 May 1960 in Launceston, Tasmania. Alan married Katrina Eeles on 2 Nov 1991 in Baptist Church, Wellington Street, Launceston, Tasmania. Katrina was born on 26 May 1968. They had two children: Ben and Brittany. 6-Ben Harris was born on 30 Apr 1993 in Launceston, Tasmania. 6-Brittany Harris was born on 15 Aug 1995 in Launceston, Tasmania. Reginald next married Ruth Mary Franklin, daughter of Frederick Henry Franklin and Margaret Mary Dolbey, on 28 Oct 1967 in Lilydale, Tasmania. Ruth was born on 20 Feb 1946 in Lilydale, Tasmania. They had two children: Michelle Mary and Catherine Louise. 5-Michelle Mary Harris was born on 31 Aug 1970 in Queen Victoria Maternity Hospital, Launceston. Michelle married Neil Cooley, son of Walter Edmund Belance Cooley and Dorothy Ruth Mathews, on 19 Oct 1991 in Uniting Church, Lilydale, Tasmania. Neil was born on 11 Jan 1954 in Launceston, Tasmania. They had two children: Simon Mathew and Monique Mary. 6-Simon Mathew Cooley was born on 14 Jul 1997 in Launceston, Tasmania. 6-Monique Mary Cooley was born on 14 Jul 1997 in Launceston, Tasmania. 5-Catherine Louise Harris was born on 22 Apr 1976 in Queen Victoria Maternity Hospital, Launceston. Catherine married Iain Alan Pinel, son of Alan Selby Pinel and Yvonne Colquhoun, on 29 Mar 1997 in Pilgrim Uniting Church, Launceston. Iain was born on 28 Oct 1970 in Queen Victoria Maternity Hospital, Launceston. They had two children: Caitlyn Maree and Dean Alan. 6-Caitlyn Maree Pinel was born on 13 Jul 2003 in Launceston, Tasmania. 6-Dean Alan Pinel was born on 17 Apr 2010 in Launceston, Tasmania. 4-George Alfred Harris was born on 24 Nov 1931 and died on 27 Jan 1992 in Launceston, Tasmania at age 60.